Biotin is excreted daily via urine, so you need to ingest it daily either in the form of food or via a supplement. In food form, you’ll find biotin in proteins, fresh foods and healthy fats. The problem is that many cooking processes eliminate the biotin from foods, as does the processing of foods, for example for convenient food packaging. You reasons for taking biotin though would most certainly not be vanity related, it is also required for the basic, essential function of cell growth, as fuelled by metabolism. That’s because vitamin B6 offers is required for the very act of metabolizing nutrients from food. It should now become clear how far-reaching the effect of not getting enough biotin is – brain health and nervous system health are among the other functions compromised by a lack of biotin. 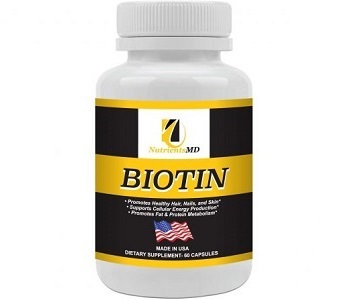 Today we review Biotin as manufactured by Nutrients MD. It promises healthy hair, skin and nails, as well as to support energy production, and fat and protein metabolism. The dose contains is more than 1600% the daily recommended intake. Should you be deficient, you will need large amounts. This is often the case for post-cancer patients, for example. The issue of potency is linked to purity though. The manufacturer says that this extract is ‘pure’ but there is no way of ascertaining this as no verification or test results as to purity are offered. A product could contain 5000 mcg of biotin but only have 50 mcg in reality. Take one capsule a day, preferably with a meal. Do not administer to children. If you are pregnant, nursing or taking any other medication, consult your health care practitioner before use. Discontinue use and consult your doctor if any adverse reactions occur. One bottle of 60 capsules retails for $9 on the product website. There do not appear to be bulk buying discounts. This biotin supplements gets good reviews but not as good as what we’ve seen for some other manufacturers though. You may only return unopened items. You must do so within 15 days from the date of purchase or from the ship date if buying it online. Biotin contains quite a high dose and if the extract itself is pure, you will see results sooner rather than later. Biotin is also an anti-aging supplement as it fights free radicals to restore skin tissue, as well as rebuild muscle. There is no way of knowing if the supplement is pure, as the manufacturer does not say or provide independent third-party testing to support this claim. If it is not pure, it could significantly detract from the potency and working of Biotin. Also, you may want to consider buying your biotin supplement in bulk, as you will need to take the supplement long term. This would add to the cost, and bulk buying often comes with discounts. We have come across manufacturers offering high potency biotin with discounts for bulk buying during the course of our research into this category of vitamin supplement.